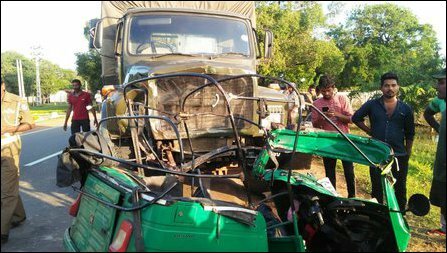 The three-wheeler was on A9 highway from Pazhai to Ki'linochchi when the SL speeding SL military truck crashed into it while entering the main road from a side lane, the eyewitnesses said. The SL military which swapped the driver had also moved the vehicles before the SL police came to the site fixing the crime scene to match their version of explanation, they further said. Everything happened quickly before the people in the area managed to realise what had happened, they said. The slain passengers were identified as 27-year-old Sivapatham Ratheeswaran, from Vadduk-koaddai in Jaffna, 32-year-old Kenaratnam Kugathasan, who is a trader from Maasaar in Pazhai, and 38-year-old Perumal Ravikumar, who hails also from Maasaar. 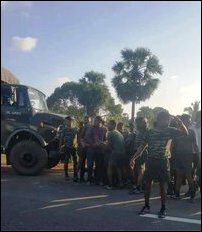 The occupying Sinhala military in the North and East does not subject its trucks for conventional vehicle controls. The courts have already condemned the lack of vehicle routines to check military vehicles for safety and environmental compliance. The SL soldiers in Vadamaraadchi East and the particular military camp at Iyakkachchi are also known for distributing drugs among Tamil youth, the people in the area said. 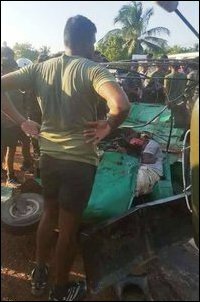 Medical sources at Ki'linochchi hospital also blamed the SL military for failing to cooperate with necessary clarifications on the fatal accident. 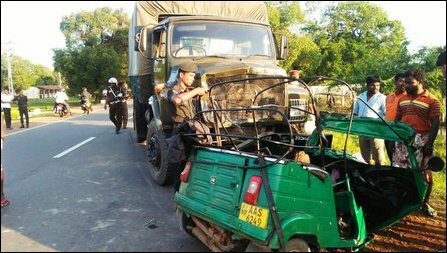 16.12.18 Protest spoils SL Police move to protect Sinhala sand-scoope..
27.02.18 SL Police take sides, Sinhala tipper drivers causing fatal a..
13.04.16 Road accidents involving occupying military escalate, jouran..
08.08.14 Tamil man dies at hospital, SL police shields traffic crime ..
20.11.10 Tamil couple in motorbike killed in head-on collision with S..